Every month, we highlight a mystery description and pictures that someone has emailed us for a FREE party!!! 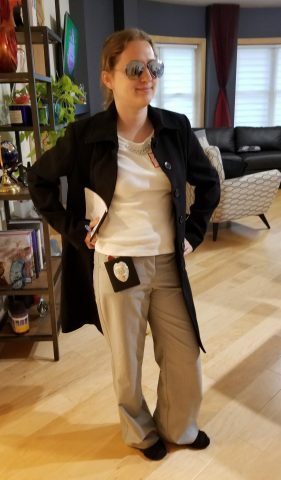 Here is August’s winner! Find out how to enter and win yourself here! 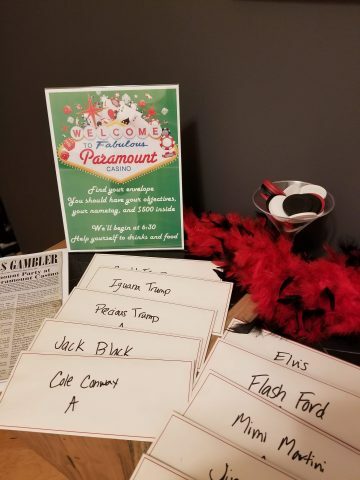 Me and my boyfriend recently moved in together and decided to throw our first Night of Mystery party, Murder in Sin City, for our housewarming! 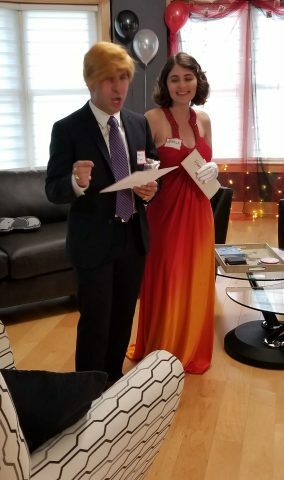 The party was amazing–the host guide laid out everything we needed to do very clearly, as well as providing a lot of ideas for costumes and decor. 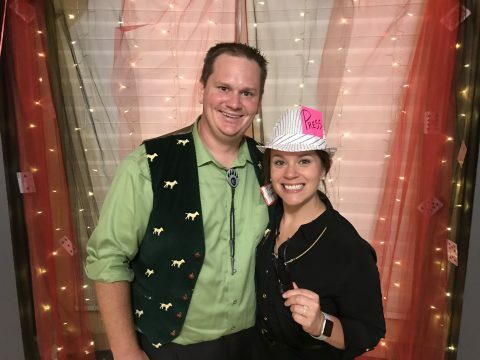 We got tons of compliments on the party, from the food to the decorations, and of course on the mystery itself! 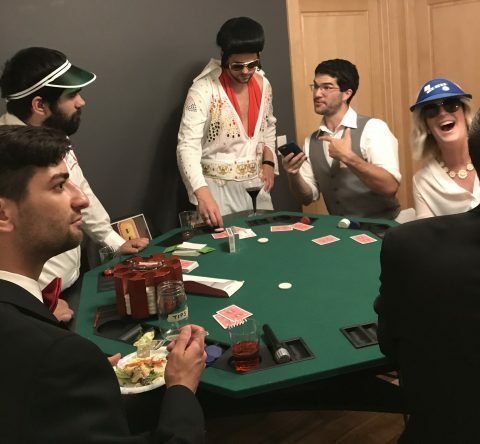 We wanted the party to feel as much as possible like a real casino party, so we talked to the guests that were assigned as staff of the casino about actually performing the job of their character: we set up a bar for our bartender, we got trays and small appetizers for the cocktail waitresses to serve, the dealers actually dealt games, and we even organized a lip sync battle between Elvis and Paul Piano (with Lucy Legs as an emcee) so the performers got a chance to perform. 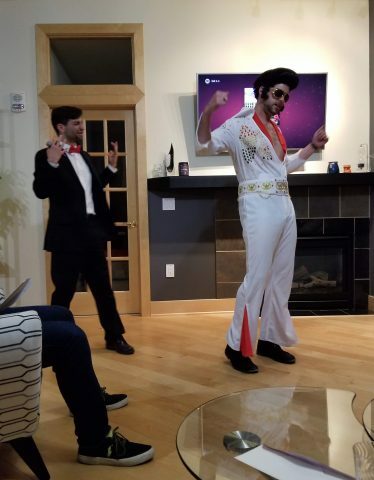 I think this really helped everyone get into character, and the lip sync battle was definitely a highlight for everyone! 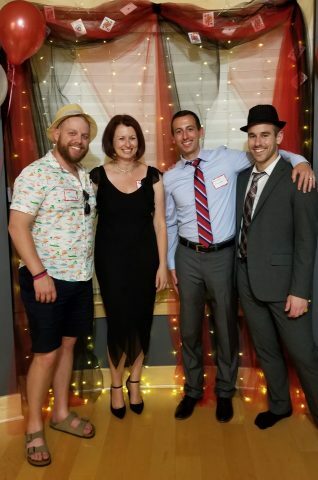 For decorations, we used inexpensive black and red tulle fabric, including a photo area arch with lights and cards suspended in the fabric. 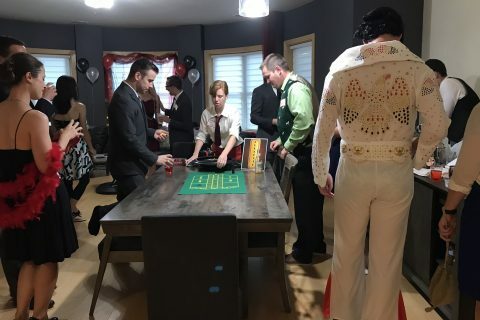 We bought some sign holders for some of the signs that were included in the mystery, and we had a poker/blackjack table and a roulette table set up, which contributed to the feel but were also functional. 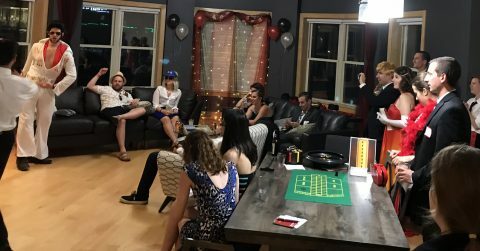 The guests were gathered around the games throughout the entire night! For food, we served dinner and appetizers, which worked out really well. We love to cook, so we made lasagna and three types of themed macrons for the guests. 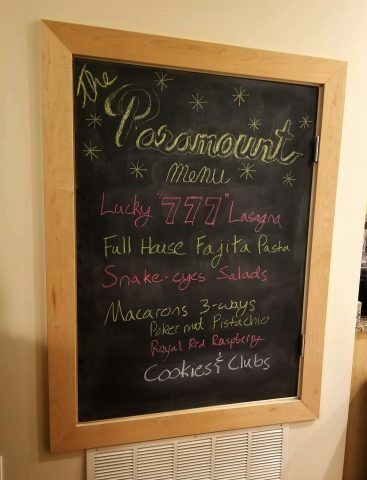 We have a chalkboard near the kitchen that served as a perfect menu board, and we came up with themed names for all food items. The mystery itself was top notch! 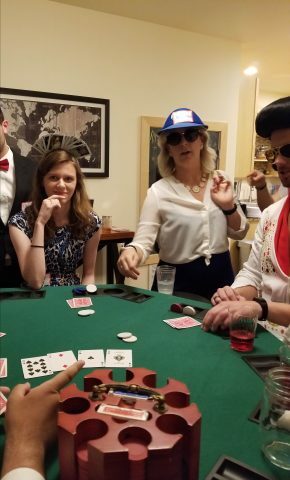 We has nearly 30 guests and all of them had rich characters and were very involved in the night. 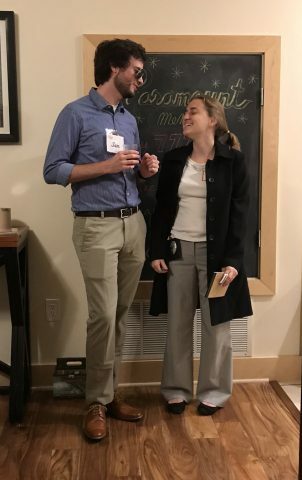 My boyfriend and I participated in the mystery–it was easy to prep the materials without spoilers, so we didn’t know any secrets going in. The story was extremely nuanced. 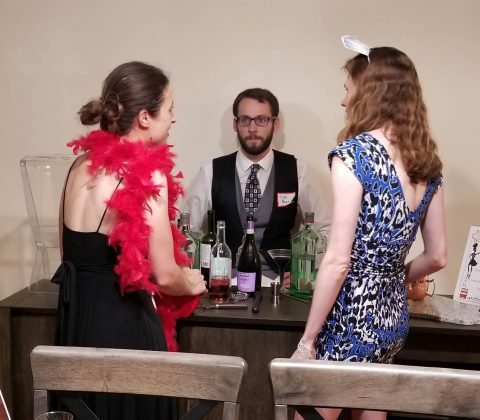 After the party, several of us were hanging out talking about how our stories interacted and we were just floored by the level of depth there was. 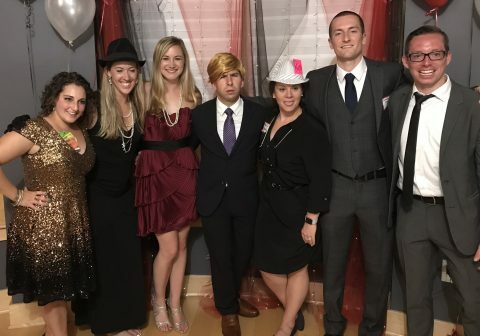 There were huge story threads that people weren’t aware of, and even now, weeks later, we’re still finding out twists and details that we hadn’t picked up on during the party itself. Overall, it was a huge success! 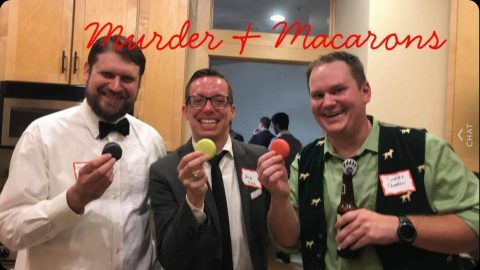 I can’t say enough good things about the Night of Mystery party kit, and we had so much fun that we’re planning to make this an annual event!